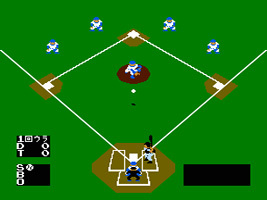 A classic baseball game on the NES. Challenge the computer or another player to a game. As the batting team, swing the bat to hit the ball, and run around the infield. If the ball is caught by a fielder, if a single batter fails to hit the ball three times in a row, or if the batter is running to a base and the ball is passed to that base, then that batter is out. As the pitching team, throw the ball to the batter. If they hit it then your fielders will automatically run for the ball. When a fielder gets the ball, you have to throw it to the base the batter is running to.